In honor of the 10-year anniversary of the start of the Protest Camp at Site 41, members of Beausoleil First Nation bring to you some informative, educational discussions on key issues facing our society today in terms of Land, Water and Human Rights (specifically Indigenous & LGBTQ2S). 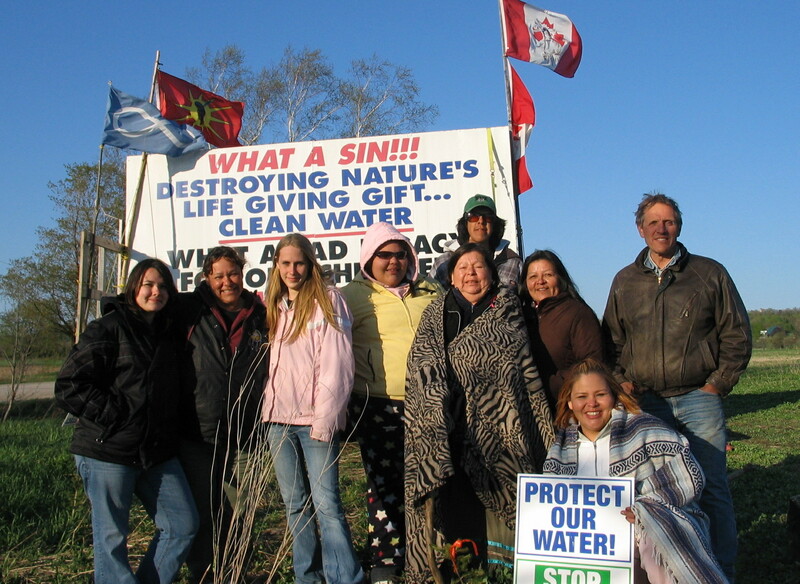 It was 10 years ago, through cold temperatures, rain and sleet that Anishinaabe women, their families, children and youth braved the cold weather and set up a Protest Camp adjacent to then proposed Site 41 Landfill on Concession 2 in Tiny Township. The historic movement was the first of its kind in the area where Indigenous and Non-Indigenous people worked together for a common cause and won. In the 10 years since the Site 41 win, Land, Water and Human Rights issues have expanded exponentially. This event seeks to build partnerships and discuss solutions to key issues moving forward together. Educators (elementary, secondary and post-secondary institutions), Elected officials (municipalities, cities, provincial and federal), Party riding associations, Health professionals and administrators, Front line public service workers who work with Indigenous clients, Police and emergency service personnel, grassroots citizens, and non-governmental organizations, First Nations citizens and organizations. Vendors are welcome free of charge. Spacing priority will be granted to Indigenous Artisans, and local area First Nations Organizations to promote their programs and services. This is a grassroots event. If you wish to sponsor to donate to event expenses, you may contact Vicki to do so. Any excess donations will go towards a one-time bursary for Social Justice Activism to a high school or post-secondary school student that is a member of Beausoleil First Nation, and will be administered by the Beausoleil Education Authority (the hosts will be exempt). Non-perishable food items will also be accepted and will go to the Taaswin Food Bank on Christian Island. SINGLE USE PLASTICS, INCLUDING WATER BOTTLES, ARE NOT PERMITTED. Light refreshments will be served, bring your own utensils, plates and bowls. B. Jeff Monague is a veteran of the Canadian Armed Forces, as well as former Chief of Beausoleil First Nation. Jeff made history being the youngest Chief ever elected for the BFN community. Jeff went on to promote the Ojibwe language, teaching in various schools and has been directly involved with Indigenous curriculum design. Jeff served as a Treaty Researcher and is an expert in local area history. He is a role model to youth and continues to advocate for youth engagement and youth empowerment across the many spectrums of society. As an active and engaged First Nations citizen, he has been involved with Indigenous Grassroots communities, supporting the Idle No More movement and other various movements across Canada. Jeff was responsible for negotiating a historic agreement on behalf of Beausoleil First Nations and the Ministry of Natural Resources for Springwater Provincial Park, saving the park from closure. Jesse Michael Sharma is one of the lead organizers of the first ever Niizh Manidook Pow Wow that was held at Springwater Provincial Park in 2018. Jesse nintishinikaaz. Saakiin nintoonji. Shiihshiipehns anishinaabe noozowin. Mahkwa nintootem. Anishinaabe indaaw miinwaa kanien’keha indaaw. Aanj bineshiinh ikwe indaaw miinwaa akinamaago ikwe indaaw. Nimaamaa saakiin oonji. Nookmis saakiin oonji. Nintaataa Trinidad and Tobago oonji. My name is Jesse Sharma. I am from Saugeen First Nation. Little Duck is my Ansihinaabe name. I am from the bear clan. I come from the Anishinaabe and Mohawk nations. I belong to the two-spirits nation. I come from changing bird woman and woman who leaves tracks on earth. My mother is from Saugeen Ojibwe Nation. My grandmother is from Saugeen Ojibway Nation. My father is from Trinidad and Tobago. Georgian Bay and Big Sturgeon Island is where I live currently. Sacred seeds collective is where I work. What time does this event start and finish? Check the poster link Jim. This event runs from 11am to 7pm.